Summer Sounds. Music is for life, not just for term time. Home » News and views » Julie’s blog » Music is for life, not just for term time. Music is for life, not just for term time. Guest blog by Year 13 leaver, Eliza Cox. I joined Nottingham Girls’ High School in 2004 as a Reception pupil and continued at the School until finishing my A-levels just over a month ago. Even though I have supposedly finished my time at NGHS, already I find myself back on the campus. For the past three weeks I have been working at the ‘Music Makers’ Summer School in The Space, which was set up by Mark Rolfe in 2007. 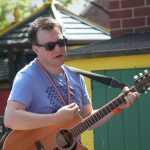 This paid job has included writing arrangements and running Junior Choir every morning, music workshops such as ukulele orchestra or intermediate singing and a music group called the Chill Out Sessions consisting mainly of acoustic guitars and vocals. 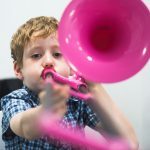 The children have so much fun, and I can say that confidently because I myself have attended Music Makers every summer for at least a week since the course first started. Even though I have been a part of the course for years now, the talent the kids show always astounds me. The weekly end-of-course concert seems to somehow get better and better every year. It’s a great experience being able to give something to the kids that will hopefully inspire them to learn a new instrument or continue to develop their musical talents as they grow up. 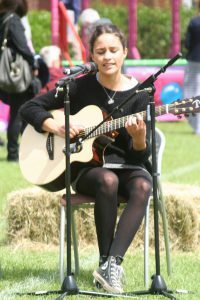 Whilst I have attended NGHS, music has always been a big part of my school life. 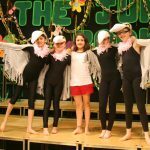 Whether that was playing in Year 5 informal concerts, playing Mowgli in my Year 6 production of The Jungle Book, being part of the choir since Year 7, playing solos in the annual House Performing Arts concert or simply playing in the termly school concerts, the experience as a whole has made me the person and performer I am today. In Year 9 I was made a Music Scholar and, not only the support, but also the enjoyment I have received in engaging with and taking part in the music department and music as a whole within school, has been fabulous over the years; I am very sad to be leaving it behind. Although Music Makers was where I first picked up a guitar, the School, and particularly the music teachers, have supported me throughout the years to improve myself, and with the introduction of new music scholarships there will be some incredible talent recognised and nurtured. In the future I intend to continue playing guitar and singing as a hobby and hopefully return to school many years into the future every summer to work at Music Makers along with Mark Rolfe and the incredible staff and children.